While inflation remained low through 2017, certain key benefit plan limits have increased slightly for 2018. This week the IRS officially announced those limit adjustments for various health, retirement and fringe benefit plans. General IRS information about these notices is available here for Health & Welfare plans and here for Retirement plans. The Health Flexible Spending Account (FSA) employee contribution limit will increase to $2,650. This limit also applies to any Limited-Purpose Health FSA plans. Dependent Care contribution limits are not indexed to inflation, and thus remain unchanged at $5,000 per year per household (or $2,500 if married and filing a separate tax return). Although announced earlier this year, we will also remind you that Health Savings Account (HSA) contribution limits will increase slightly to $3,450 for self-only coverage and remain unchanged at $6,900 for family coverage. A relatively new benefit plan type – Qualified Small Employer Health Reimbursement Arrangements (QSEHRA) has inflation-adjusted maximum reimbursement thresholds. The plans can be established by small employers as standalone HRAs to reimburse individual medical premiums and other medical expenses. The reimbursement limits for 2018 will increase to $5,050 for single coverage and $10,250 for family coverage. Qualified Transportation and Parking Benefits will each have monthly reimbursement limits rise to $260. Certain Retirement Plan limitations were also modified slightly. Most notably, the 401k plan elective deferrals limit has increased to $18,500. 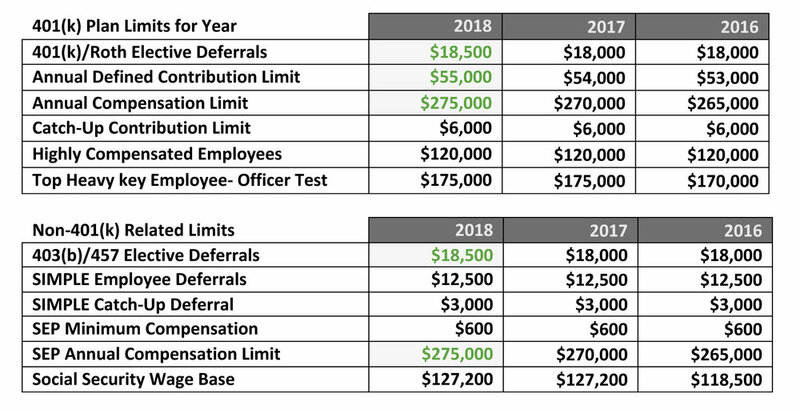 See the chart below for other key retirement plan limits for 2018. Posted on September 19, 2017 by Habeeb Habeeb.